Breaking News — Carl Bernosky hung on to win his 10th National High Power Championship, with a 2391-141X final Aggregate. Just one point behind, after four days of competition, was 2010 Champ SGT Sherri Gallagher. Sherri shot a 200-12X in the final event (Crowell Trophy Match) to close the gap, but it was too little, too late. Bernosky had a lead going into the last event, so even though he dropped a point (scoring 199-13X in the Crowell), he was able to prevail by a single point. Had Carl dropped two points, he still would have won the Championship because Carl had a higher X-Count than Sherri, who finished with a 2390-131X Agg. All in all, it was a well-deserved win for a great shooter, one of the best ever, that’s for sure. This was one of the most exciting championships in recent memory. Two shooting marvels, both past High Power National champions, were neck and neck all the way ’til the end. And either could have lost the title with one errant shot or crossfire. SSG Brandon Green of the USAMU shot a superb match to finish third with 2388-135X. Multi-time High Power Champion David Tubb racked up the fourth-highest Aggregate: 2387-145X. That means David had the highest X Count of the top 5. However, we’re told by Emil Praslick that: “David Tubb shot his Match Rifle fitted with a scope this year, placing him in the Any Sight/Tactical Class.” Accordingly, Tubb was not in the running for the overall championship. 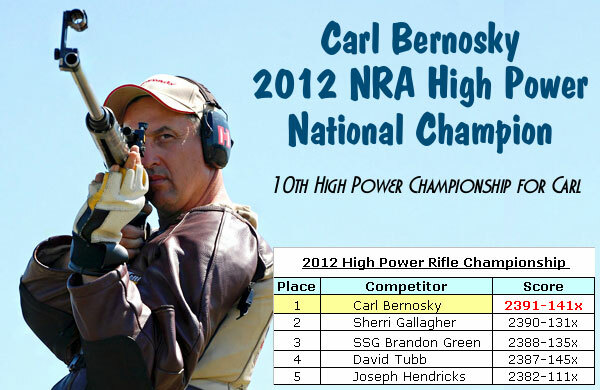 We congratulate Carl Bernosky on his hard-fought victory in 2012. This title brings Carl’s total to 10 High Power Championships, really an amazing accomplishment. We also congratulate runner-up SGT Sherri Gallagher, and all the shooters who competed at Camp Perry in the High Power Championship events. 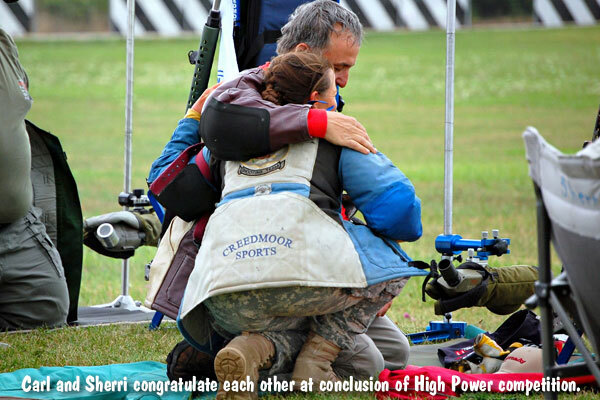 Share the post "Bernosky Wins 2012 High Power Championship by Single Point"
Highs in the low 60s and puddles from yesterday’s rain created a chilly, muddy atmosphere for the start of the Long Range Championships. The Band of Brothers Trophy Match was the first match fired. 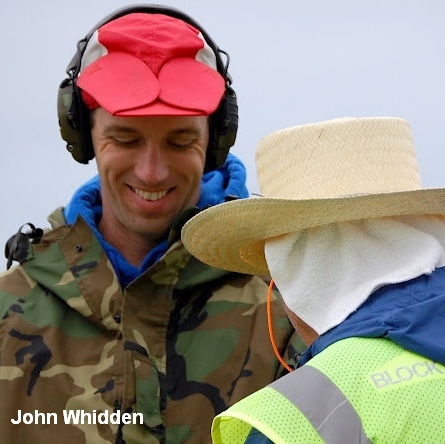 The early scores show that the elite shooters, such as past Long-Range Champion John Whidden, brought their ‘A’ game, and are able to handle the cooler weather and cloudy skies. There were a number of 200s shot on the range this morning at the Band of Brothers match. Share the post "Long Range Championships Start in Soggy Conditions at Perry"
Bushnell is now offering rebates on popular rifle scopes and spotting scope. Through this “Bushnell Bonanza” promo, you can save up to $75.00 on Elite, Legend Ultra HD, or Trophy XLT Riflescopes and Spotting Scopes. An Elite would be a choice for an affordable optic for your hunting or varminting rifle. Bushnell’s Elite series of scopes are pretty darn good for the price, and Bushnell offers a ‘Bullet-Proof’ money-back gaurantee — if you don’t like the scope, send it back, and Bushnell will refund 100% of the purchase price. Can’t argue with that. To get your rebate, you must purchase a qualifying product before the end of October. Then you must complete a REBATE FORM and mail it (along with Sales Receipt, and Package Barcode tag) back to Bushnell before 11/15/2012. Promo Tip from EdLongrange. We welcome reader submissions. 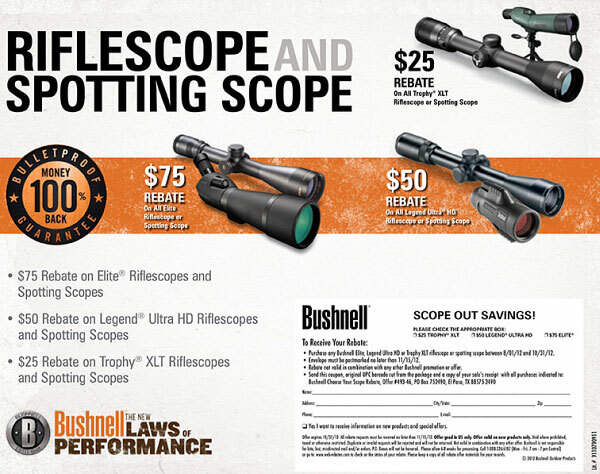 Share the post "Get Rebates on Bushnell Rifle Scopes and Spotting Scopes"